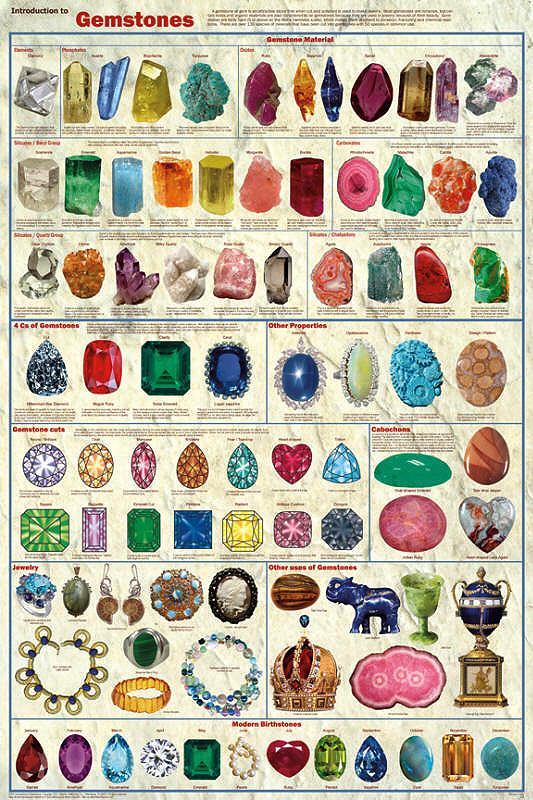 This poster begins by showing the most popular gemstones, grouped together by class. It explains the important "Four C’s" of gemstones - Cut, Clarity, Color and Caret, followed by an introduction to other important qualities, such as Asterism, Opalescence, Hardness and Pattern. The next row provides wonderful illustrations of the important gemstone cuts, accompanied by an explanation. This is followed by an introduction to cabachons. It then presents an assortment of jewelry. The focus is on affordable items, including some that enthusiastic can make themselves. Next comes non-jewerly use of gemstones - collectible eggs, carvings, decorative slabs, and royal crowns. Of course we had to include a famous Faberge egg. The bottom row presents all the birthstones, in accordance with modern-day standards.